Tesla gets crushed by the big boys. Total new-vehicle sales in the US fell 5.2% year-over-year in December to 1.6 million units. For all of 2017, sales declined by 320,000 vehicles, or 1.8%, to 17.23 million units. It was the first overall decline since the Financial Crisis. Compared to 2015, sales fell by 249,033 vehicles, or 1.4%. These sales are vehicles delivered by dealers to their customers, or delivered by automakers directly to large fleet customers, as reported by Autodata. Turns out that replacement demand for new vehicles after Hurricane Harvey was strong, but not nearly strong enough to pull out the year for total US auto sales, and what demand there has been will peter out going forward. Car sales plunged 17% year-over-year in December, 10.9% in all of 2017, and 18.1% from 2015. They’ve been left behind by consumers who’re switching to crossovers and SUVs which the industry considers trucks. So truck sales – pickups, SUVs, crossovers, and vans – rose 1.7% in December, 4.3% for the year, and 11.8% compared to 2015. A special word about Tesla. 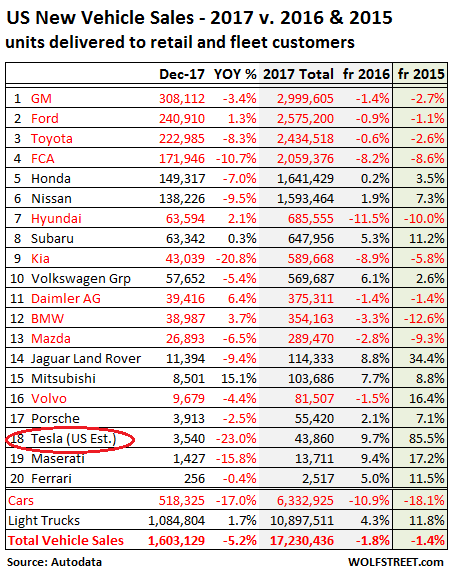 Tesla, in 18th position near the bottom of the list, wants to play with the big boys, but doesn’t want people to know on a monthly basis just how inconsequential its US sales are. Since it refuses to disclose how many vehicles it delivered that month in the US, the industry has to estimate Tesla’s monthly US sales. Autodata estimated that Tesla delivered just 3,450 units in the US in December, down 23% from a year ago. For the whole year, Autodata estimated that Tesla sold 43,860 units, up 9.7%. This gives Tesla a share of 0.2% of the 17.2 million units sold in the US, behind another niche manufacturer of expensive cars: Porsche (55,420 sales in 2017). Instead of December sales in the US, Tesla disclosed global sales for the fourth quarter on Wednesday: 15,200 Model S, 13,120 Model X, and just 1,550 Model 3, some of which have been “sold” to its own employees for testing purposes. So in total, Tesla sold 29,870 vehicles globally in Q4. We still don’t know how many vehicles it sold in the US in December. Hence the estimate. Last February 2017, Tesla said with its usual hype that Model 3 production would “exceed 5,000 vehicles per week at some point in the fourth quarter.” This would mean over 20,000 units per month “at some point” in Q4. So maybe 10,000 in October, 16,000 in November, and 20,000 in December, totaling 46,000 in Q4. In reality, it sold 1,550 in Q4. This would mean about 1,060 in December. But you have to admit that Tesla’s endless hype works. Hence, Tesla’s market capitalization of a ludicrous $53 billion is among the highest of the Big Boys. GM – facing no “production bottlenecks” and no “manufacturing hell,” as Tesla and its CEO called their own mess – delivered 3,227 Bolt EVs in December, bringing the total for the year to 23,297. The Bolt was rolled out in October 2016 in California and Oregon. By August 2017, it was available in all states. In September, GM sold 2,632 Bolts; in October 2,781; in November 2,987, and in December 3,227, making it the best-selling EV in the US for the last three months of 2017. GM’s total sales fell 3.3% in December to 308,539 units, with truck sales rising 8.9% to 249,961 and car sales plunging 34.9% to 58,151. It ended the month with 63 days’ supply, down from 83 days’ at the end of November, and down from over 100 days’ earlier in 2017. This brought GM close to what is considered healthy (below 60 days’s supply). Ford’s total sales rose 0.9% to 240,910 vehicles in December, with car sales dropping 5.5% to 48,380 and truck sales rising 3.2% to 192,530. Among those trucks, SUV sales jumped 8.0% to 82,881 units and F-series sales rose 2.1% to 89,385. FCA’s total sales plunged 10.7% in December, with car sales down 11.2% to just 19,648 units and truck sales down 10.6%. Truck sales are hot as consumers are switching from cars to crossovers – but not at FCA. For the year, total sales dropped 8.2%, with car sales down 22.2% and even truck sales down 5.8%. Letting Fiat run Chrysler might not have been such a great idea. Now the problem is 2018. Rising interest rates will make these vehicles even more unaffordable for many people — GM said its average transaction price was over $38,000 in December! Soaring defaults on subprime auto loans are causing lenders to tighten up their underwriting standards, thereby locking many potential buyers with subprime credit ratings out of the new vehicle market. Ballooning negative equity in trade-ins — a result of years of lengthening loan terms and rolling everything and its dog into the car loan — makes it difficult for dealers to get new-car deals financed even for people with good credit. So if the US economy keeps humming along nicely, it’s likely that auto sales in 2018 will be below sales in 2015. If something slightly untoward happens, however, sales could end up below where they’d been in 2014.